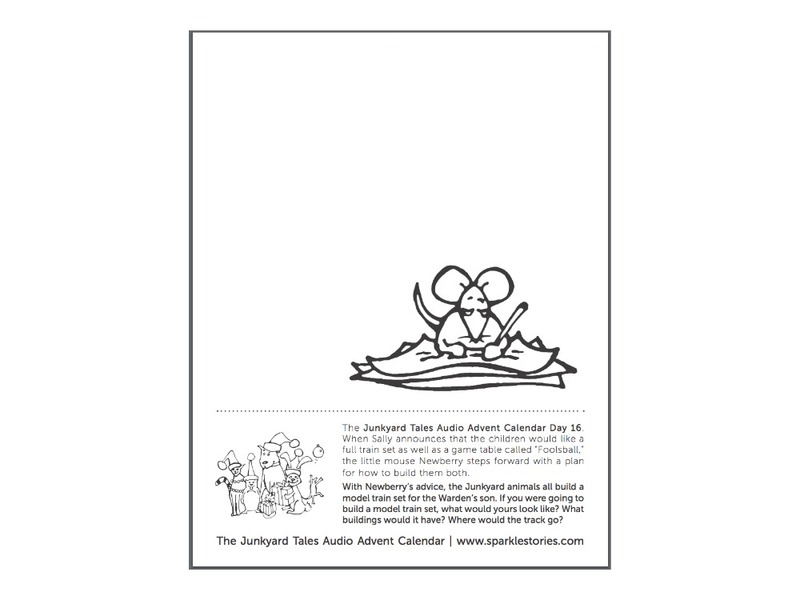 The Junkyard Tales Audio Advent Calendar Day 16. When Sally announces that the children would like a full train set as well as a game table called “Foolsball,” the little mouse Newberry steps forward with a plan for how to build them both. With Newberry’s advice, the Junkyard animals all build a model train set for the Warden’s son. If you were going to build a model train set, what would yours look like? What buildings would it have? Where would the track go? Download the Printable Coloring Page HERE. Stream the stories on the Sparkle subscription site here. Jenny Barandich is the graphic designer who brings color and magic to all of Sparkle’s graphics. With more than 20 years of experience, Jenny works with clients both locally and worldwide. She believes in unique yet practical designs that suit her clients’ needs, covering a wide range of industries including publishing, high-tech, nonprofit, medical, communications, and marketing. Jenny received a B.A. in Visual Communication from the Avni Institute of Art and Design in Tel Aviv. She now lives in Toronto with her husband and three children. This Christmas the Junkyard Warden has a challenge he doesn't know how to face - something that could change the Junkyard for good. Sergeant, the steadfast Junkyard watchdog alerts the other animals, and they immediately take it up. “We take care of each other,” they say, “Even though the Warden doesn’t know about us - he still needs our help.” All 25 stories in this Audio Calendar are about how a community faces a difficult situation. By including everyone with their strengths and quirks, they not only solve what faces them, but they get closer in the process. These stories are funny and delightful, and they demonstrate courage, authenticity, compassion, empathy and most of all - service.